The schools reopen for the new session in Kerala after the summer vacation in June every year. The school opening is marked by the commencement of the monsoon rains and in the low-lying areas of Kottayam, there would invariably be floods and the schools are often closed at least for a fortnight thereafter. Our father was the headmaster of a school in this area near Kumarakom and once I asked him as to why they cannot have an extended session till April end and have summer vacation in May and June. He said that this idea was tried out unsuccessfully as the combination of extremely hot summer days and scarcity of drinking water posed major difficulties and hence the proposal was shelved. 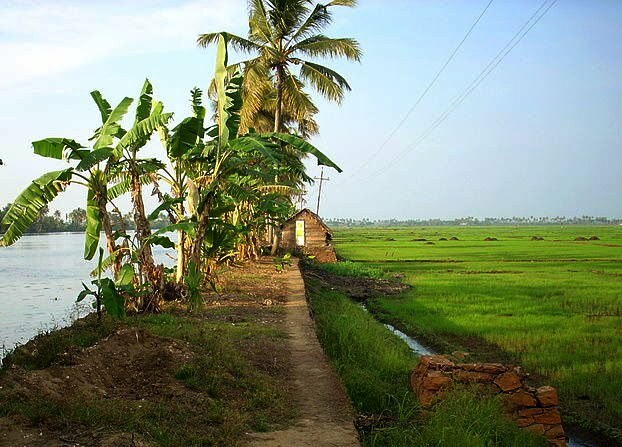 The low lying areas of Kottayam are a part of the North Kuttanad, known as the rice bowl of Kerala. This is perhaps the only region in the world where rice farming is done at about 2.5 meter below sea level. The paddy fields are reclaimed land from the backwaters. In case one embarks on a boat ride through the backwaters, one can observe that the paddy fields are at a much lower level than the water level of the backwaters. If you carefully observe the image above or below, you can differentiate the two levels. 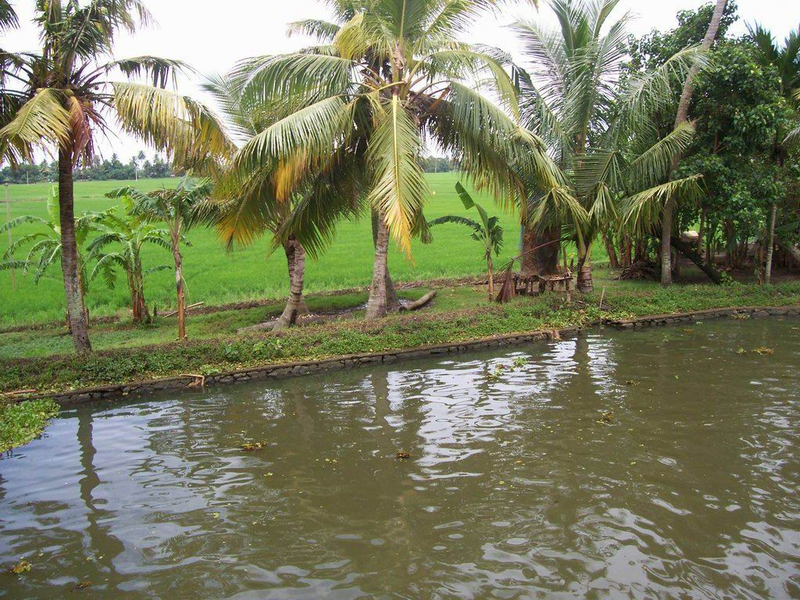 Kuttanad meaning ‘low lying lands’ is one of the most fertile regions of Kerala, spread over the districts of Alappuzha and Kottayam, crisscrossed by rivers, canals and waterways. The region contains the low lying lands measuring about 25 kilometers East-West and 60 kilometers North-South on the West coast of Kerala. A major portion of this area lies 1 to 2.5 meters below the sea level. 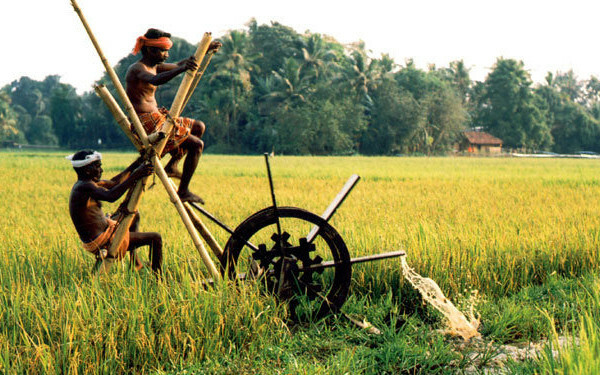 Kuttanad has 1, 10,000 hectare area, of which 50 % is reclaimed and 88 % is under agriculture. The area is characterised by Dyke building in deep waters, land reclamation and maintenance and Rice-Fish rotation farming. The dykes (bund) construction and maintenance are intricate tasks, for which an array of long and stout coconut poles are hammered deep enough into the lake bed in two rows, about two meters in width enveloping the entire area, It is then fenced with bamboo mats on either side. The channels of the bund are now filled to the desired height, first with sand, followed by twigs, interspersed with high quality clay dug from the bottom of the lake. Then water is pumped out and the land is prepared for rice cultivation. The dykes are now mostly permanent ones built with granites and concrete. Only a few gaps are left to facilitate flowing in of water after the harvest. The gaps are filled prior to cultivation as mentioned above. In the earlier days, water was pushed out from the low lying areas manually using a waterwheel. Nowadays, the manual labour has been replaced by electric pumps. During heavy monsoons, the flood waters may breach the bunds and inundate the paddy fields, causing heavy losses to the farmers. The fresh water environment close to rice fields and the canals provide abundance of Pearl spots (Karimeen for which Kerala is well known for), fresh water giant prawns (attukonju) and freshwater catfish. 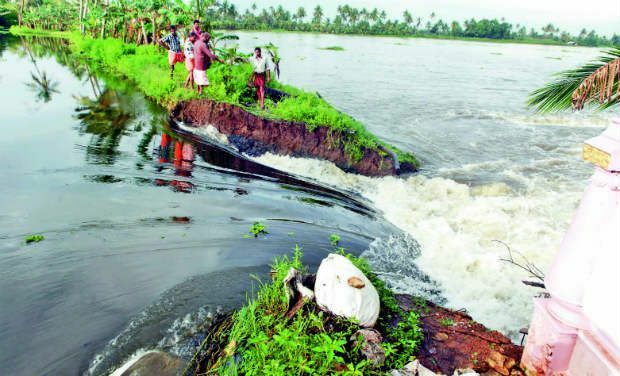 So much for the geography of Kuttanad and its peculiarities. Let me now relate to a monsoon related necessity. It was customary for our father to gift all four of us with an umbrella, with our name inscribed on it, at the beginning of every school year. One either lost them or damaged them as the school year passed by. In the autumn of his life, he resumed the old habit and continued with the same gift to all his grand children. In China, gifting your friend an umbrella means you want to end the relationship because umbrella sounds like San in Chinese, which means to separate. Giving a married couple an umbrella as a gift should be avoided in all cases, at least in China. The Chinese believe that if it is raining and you are worried he or she will get wet, it’s better for both of you to huddle under one umbrella until you reach your partner’s destination. That brings me to a personal anecdote related to the gifting of umbrellas. A few weeks after assuming command of the unit in the operational area in Rajasthan, our Second-in-Command (2IC) Late Col Suresh Babu approached me to discuss a case of about 100 umbrellas lying unsold in the Regimental Canteen at Devlali, Maharashtra. He proposed a 50% reduction sale for them. I realised with the unit in the operational area, it may not be feasible to execute the sale. After analysing the loss being incurred by the canteen and the overall cost of the umbrellas, and taking a cue from my father, I decided to buy all of them from the Regimental fund and ordered them to be gifted to all children of the unit at the beginning of the academic session. As in Kerala, in Devlali too, the monsoons pour down heavily coinciding with the school opening, but luckily there are no floods. The gift must have impressed all the families and children, back in Devlali as they had not yet met the new Commanding Officer. In 2009, five years after handing over command, I received a call from Subedar Ravinder Singh. His son came on line and told me that the umbrella I had gifted him at the time of taking over command of the unit has been preserved by him and was always a sign of encouragement for him. He also expressed his gratitude for training all the children of the unit on computers and that early introduction to technology had him exploring the world further and how it has helped him in his present career. Most of your deeds and actions may not matter much to you, but it matters to the one who is in the receiving end. The resultant effect will always be as to how the receiver perceives it. And, if the recipient perceives it well, he or she will replicate it in later life, in one form or the other. Good deeds generally have a chain reaction as do bad deeds. But in case of good deeds the chain is generally much longer than in the case of bad deeds. Informative and let’s not stop the generosity. Nice narration & I’m addicted to your wonderful articles. Just returned from Kuttanad… Related to what you have narrated about the area..